This drill is supposed to challenge defense by exagerating their gap. By exagerating their gap in drills like this, they should become more comfortable in game situations. The drill starts when the two defense receive a pass at the blue line. The puck needs to be passed to the defense in the middle of the ice for a shot. The forwards can go once the shot is taken. 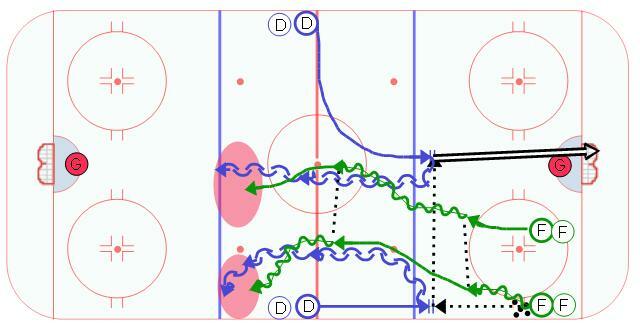 The then go down the ice on a full ice 2 on 2. The goal for the defense is to make the play just before the blue line by forcing a dump in, forcing the off-sides, or simply breaking up the play before the forwards can gain possession in the offensive zone.